Has 80+ app scripts included. Final ISO will be about 300MB. Download, extract, run winbuilder.exe, point to a WindowsXP source & click play. Very good effort, would be nice to see your version also available on the downloads portal. I uploaded the default liveXP project right now and it is packed with 300Mb of app scripts, does it differ much from the version that you are making available? @amalux - can you also make available you prepared packages? Or perhaps we three can agree on a single version that is revised and contains just about everything? btw: FTP access to winbuilder.net should become operational again within a few days. Nice, will try the ftp when it's available. About this project: Just want LiveXP to stay alive for some more time. Maybe I changed something so it's not compatible with the original LiveXP, don't remember; not very well organized here. One thing is 100 % sure: Not all scripts working in Win7PE is working in LiveXP, but almost all scripts working in LiveXP works in Win7PE (and VistaPE). Last thing: ALL app scripts included in this project is from 2011 April or later. Ps. If Amalux is willing to put the whole chobang together in ONE livexp-project: Very much OK of course! I've been using a bartpe/winxpe rescue disk for at least 5 years now. Decided to try something new. I found several problems with this updated package. 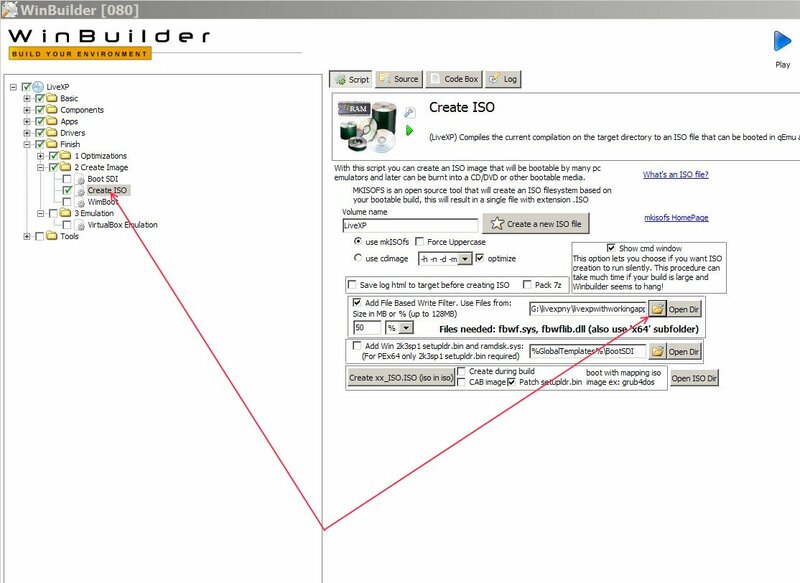 Troubleshooting for a while just to get it to build then after it built it wouldn't create the iso until I finally had to comment out a line that checked a path in the Create ISO script so I could get WB to create the ISO file. Then I booted the image and the boot halted from missing or corrupted .sys files from various apps which I started to replace one after the other. Finally it got to the boot screen ( some porsche type car) then just hung indefinitely. It was a couple hours from beginning to end I had enough and gave up. So then I decided to try the original LiveXP and downloaded the zip file only to find corrupted files in the zip. I only post this to warn others new to this site, don't bother with the Livexp thing, try something else. It isn't worth the headache. As a "beginner" (no offence intended ) you should use pre-made, verified packages. without a link to the specific corrupted/problematic .zip file. I only post this to warn others new to this site, don't bother with the Livexp thing, try something else. It isn't worth the headache. You will be able to say that it is not worth the headache (IF this is the case) only AFTER you have created successfully a build, right now you are only venting about your own failure at building it. Updated first post with new package and additional “How To”. (about ImDisk) shouldn't a major inconvenience. Nuff said. and I'd like to add BGINFO to the Startup folder or to RunOnce registry branch. you can use my BGInfo script. it is completely customizable, including startup options and compatable with LiveXP.